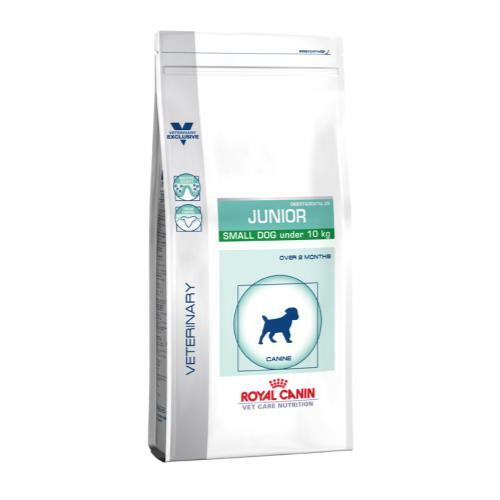 Royal Canin Pediatric Junior Small is a scrummy diet with targeted towards alleviating sensitive teeth & gums as well as delicate digestion in small dogs. A complete pet food, this bespoke recipe provides your dog with total, balanced nutrition, whilst a careful blend of highly digestible protein and dietary fibre stimulates the production of friendly bacteria in the stomach for a flourishing digestive system. Full of antioxidants to bolster your pet’s immune system and promote overall wellbeing, the kibbles are also loaded with calcium to minimise the accumulation of tartar and contribute to tip top gnashers. This bespoke recipe is made with Royal Canin’s patented formula which helps to nourish the skin from the inside, forming a barrier against the elements and keeping your dog bright eyed and bushy tailed. Maize, dehydrated poultry meat, animal fats, rice, dehydrated pork protein, wheat flour, hydrolysed animal proteins, beet pulp, minerals, wheat gluten*, soya oil, fish oil, fructo-oligo-saccharides, hydrolysed yeast (source of manno-oligo-saccharides), marigold extract (source of lutein). Nutritional Additives (per kg):Vitamin A: 25200 IU, Vitamin D3: 800 IU, E1 (Iron): 41 mg, E2 (Iodine): 2.9 mg, E4 (Copper): 9 mg, E5 (Manganese): 54 mg, E6 (Zinc): 205 mg, E8 (Selenium): 0.1 mg - Technological additives: Pentasodium triphosphate: 3 g - Preservatives - Antioxidants. Good Boy Lob it Space Lobber Dog Throw Toy 7.5"